Clarence Thury, 91, of Parkston, died Wednesday, November 7, 2018 at Avera Bormann Manor in Parkston, SD. Mass of Christian Burial will be 10:30 AM Monday, November 12, 2018 at Sacred Heart Catholic Church in Parkston. Burial will be at the Sacred Heart Catholic Cemetery in Parkston. Visitation will be from 5-7:00 PM Sunday at the church with a 7:00 PM scripture service with rosary. Arrangements by Bittner Funeral Chapel. Clarence H. Thury was born April 18, 1927 in Parkston, SD to Paul and Mary (Polries) Thury. He attended grade school in Parkston and graduated from Parkston High School. He enlisted in the US Army and served during the World War II Era, and was honorably discharged in 1947. Clarence married Lois Weber on June 20, 1950 at Saints Peter and Paul Catholic Church in Dimock, SD. They farmed in the Ethan and Parkston area for their entire lives. He was a lifelong member of the Knights of Columbus, earning the honor of 4th Degree Knight. 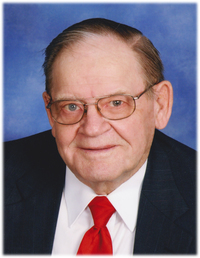 He was active in the National Farm Organization, Farmers Union, Farm Mutual Insurance, and was a lifelong member of the American Legion. He was a member of Sacred Heart Catholic Church and sang in the choir, was a lecturer, and served on the Sacred Heart Cemetery Board. Clarence is survived by his four children, Ronald (Connie) and Dave (Judy) Thury both of Parkston, Joyce (Darrell) Rich, Broken Arrow, OK, and Linda (Steve) Weber, Dimock, SD; 14 grandchildren; 32 great-grandchildren; brother Father Gerald Thury, Dimock; and sisters Betty Fergen, Ethan, SD, Joan Fideler, Tucson, AZ, and Jean Severin, Omaha, NE. He was preceded in death by his wife, Lois; parents; seven brothers, William, Louis, James, Leonard, Donald, Joel, Fredrich; two sisters, Delores Eisenbraun and Karen Stein; a child in infancy; and a granddaughter, Pamela Weber Bialas.